Capterra surveyed over 400 event management businesses of all shapes and sizes to compare what types of software they actually use. Managing an event is complicated, especially when you get down to the fine details of guest lists, ticketing, venues, catering, and keeping all of it to a tight schedule. All-in-one event management software has changed the game and made it easier for event managers, businesses, and nonprofits alike to organize and host events. But which event products are the most popular? Which ones are the best fit for your industry? What can you expect to pay for event management software tool? To answer these questions and a whole lot more, we at Capterra conducted a survey of hundreds of event management software users in all different types of industries. This event management software survey report will provide insight into the benefits, uses, costs and motivations for buying event software. Event planners and managers spend an average of $1,163 monthly on event management software. Unfortunately, event software satisfaction is low, with 22% of respondents being dissatisfied or very dissatisfied with their current software. The most common reason (39%) people were dissatisfied with their event software was that it lacked certain features. For instance, 22% of respondents said their event management software lacked room block management capabilities. The three most-desired event software features were RFID integration, event gamification, and the ability to manage event sponsorships. 48% of respondents actually spent less money on event management software than they expected to. Only 19% spent more than they expected. 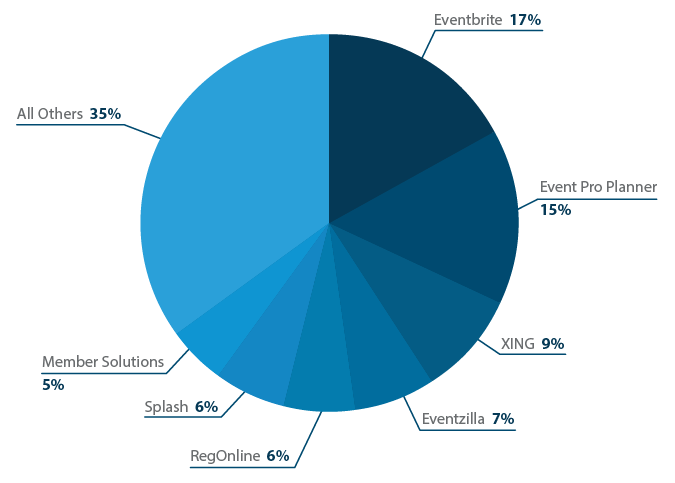 Who uses event management software? While many different industries, whether for-profit or nonprofit, use event management software, the vast majority of users are in the corporate/private sector. 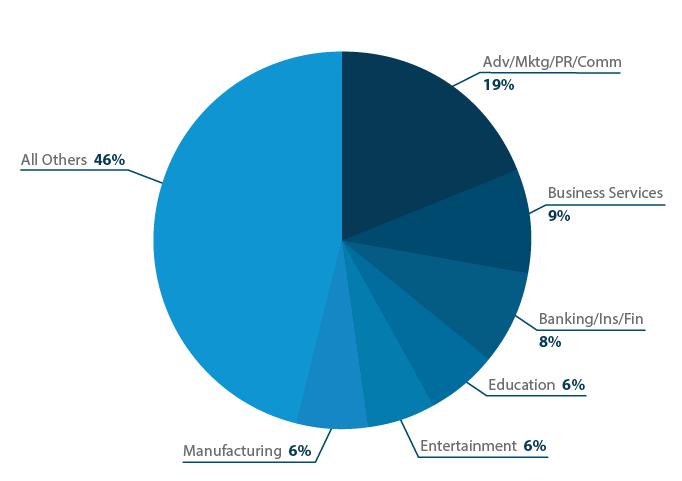 The largest individual block belongs to Advertising/Marketing/PR/Communication (19%) followed by Business Services (10 %), Banking/Insurance/Financial Services (8%), and Education (6%). While it is not surprising that advertising and marketing are so high on the user scale, since their department is charged with attracting attention and guests to events, it came as a surprise that education made it into the top four. 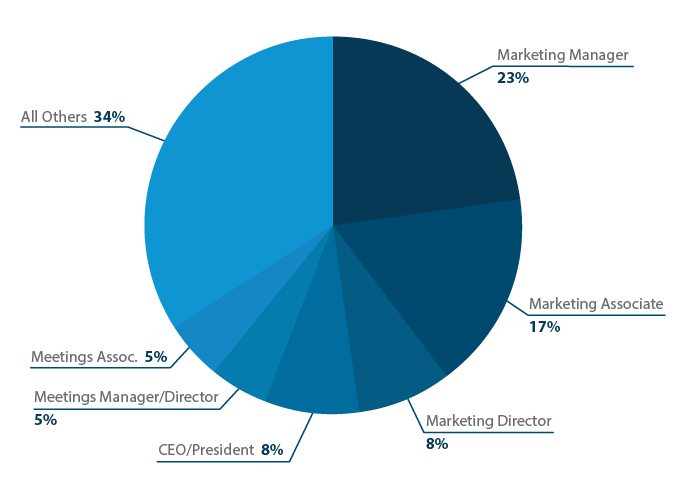 As for individual job roles, the largest slices of the pie belonged to marketing managers at 23% and marketing associates at 17%. Perhaps this is due to the fact that hiring a whole extra department for event management is not worth the cost for most businesses. It could also be because the type of events a marketing team wants to put on are more complex or require more advance planning than those that a sales or HR team tend to run. Eventbrite is the most widely used event management software option, at 17% market shareTweet ThisWe found Eventbrite is the most widely used event management software option, at 17% market share. When it comes to the use of different software options, Eventbrite, EventPro Planner, and XING Events ran away as the most popular options. The fact that Eventbrite takes the cake runs parallel with our Top 20 Most Popular Event Management Software list. Further breakdown of the data showed that smaller companies and organizations opted for cheaper or free options such as Eventbrite, while larger companies chose more established options like Cvent. This may be explained by the fact that Eventbrite offers free use, with ticketing costs passed onto the event attendees, while Cvent charges start at roughly $200 per month. Smaller business will look to mitigate their costs by passing them on to event attendees. In fact, as evident in the chart above, 30% of Eventbrite users fell within the $1 million to $5 million range for their annual revenue, while larger companies made up a higher proportion of users in higher-priced event management services. Event managers face a lot of unknowns and surprises when buying event software. Why did you buy event management software? Why didn’t you buy event management software sooner? 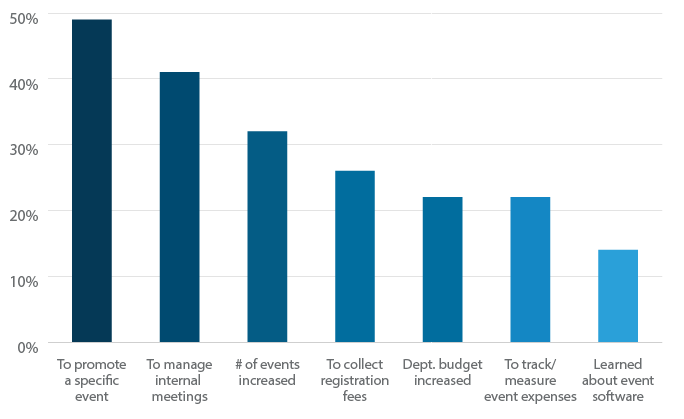 The most frequently cited reason respondents gave for buying event management software was the need to promote a specific event (49%), followed by needing to better manage internal events(41%), an increased number of events each year (32%), and the need to collect event registration fees (26%). Yet, when asked why respondents didn’t buy event management software sooner, the inability to justify the expense to management came in first (28%), while the second highest response was the fact that they didn’t know the software existed (24%). This shows vendors may not be doing a good job communicating the costs of event management software, or even that their solutions exist. In fact, that ignorance about the existence of event management software may also be an explanation for why managers are making last minute purchases for one particular event. 57% of customers spent less than three months searching, demoing, and finally purchasing event management software. 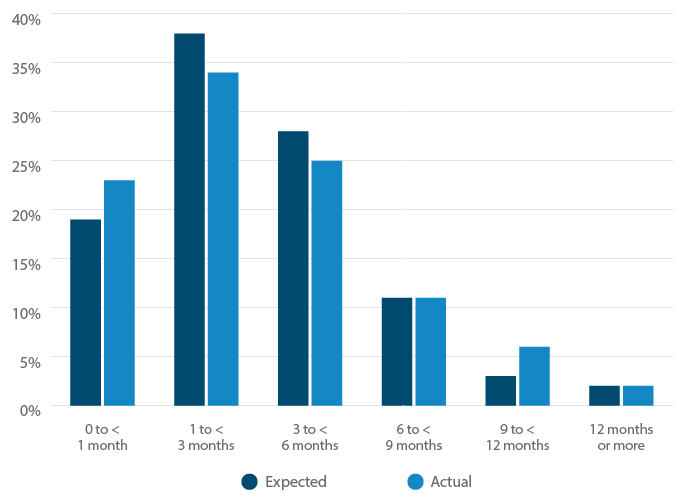 Surprisingly, respondents spent about how long they expected to in their software search, with 57% of respondents also expecting to spend zero to three months making their way through the process. How many software options were demoed before purchase? 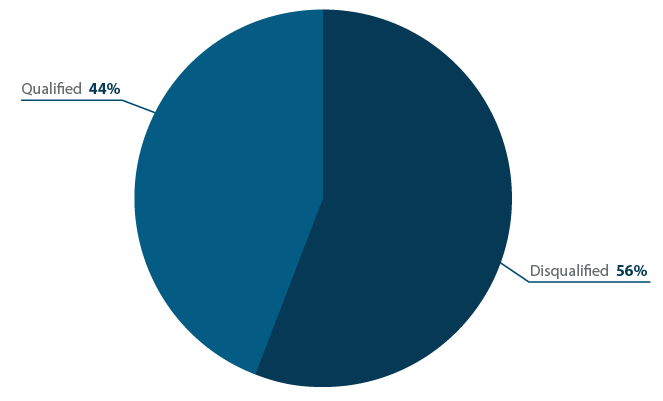 A plurality of buyers (39%) demoed two options before making a final decision on which software they would buy. When looking at the data, it is important to note that the data is slightly skewed in favor of more demos than less. 31% of respondents chose to demo three or more options, while 30% demoed either one or none of the software options before making their purchase. This means that even though the difference is very slight, event management software buyers lean on the side of being more educated on their purchase than less. How do event planners use their event management software? 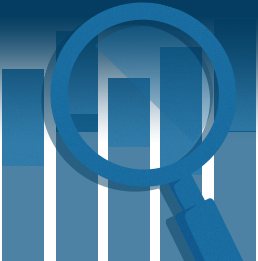 The implementation method and features used by survey respondents break down interestingly. 75% of event management software is web-based systems and 25% installedTweet ThisEvent management software use is split, with 75% using web-based systems and 25% using installed. 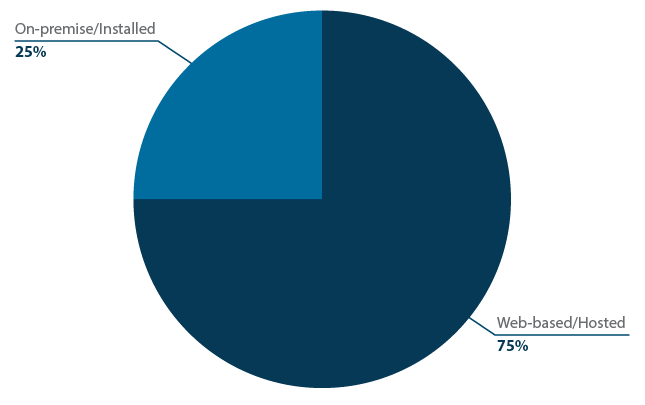 This is a larger split than in other industries, where usually only 2/3rds are using web-based tools. However, this may not be that surprising given the strong B2C interface in the event industry with things like event invitations, ticketing, and advertising all mostly done online. The demand from event attendees for online functionality and convenience likely means event managers and planners want the same from their event management software as well. The top software features used by survey respondents include attendee management (45%), meeting management (45%), employee/volunteer management (43%), payment functionality (43%), financial management (42%), and registration management (41%). These features aren’t particularly surprising when considering that the main goal of an event is to acquire as many attendees as possible while either making a profit on said event, or, in the case of nonprofits, collecting more donors and donations. Room block management (22%), sponsor management (21%), and RFID (21%) topped the list for most-desired featuresRoom block mgmt, sponsor mgmt, and RFID are the most-desired event mgmt software featuresTweet This not yet included in respondents' software. When split up between departments, priorities change for the software and the desired features. Human Resources professionals desire RFID/Bluetooth/iBeacon functionality the most (31%), while Marketing and Communications workers were looking for a focus on Room Block Management (23%), and Meeting/Events teams want gamification features (27%). In addition, when split up between “for profit” and “nonprofit” industries we found that “for profit” businesses use Meeting Management most (45%) and desire Room Block Management most (20%). On the other hand, “nonprofit” business use Attendee Management most (44%) while desiring more Mobile Fundraising features (25%). It is no surprise that nonprofits are more concerned with features for donors and fundraising, as well as bringing as many of those potential donors to their event through attendee management functionality. The same can be said for “for profit” businesses spending more on meeting management considering the frequency of business meetings with investors, board meetings, mergers, big company decisions, etc. What is the cost of event management software? We found some interesting information on what you can expect to pay for an event management tool. How much do you spend monthly on event management software? A majority of users (59%) spent less than $1,000 dollarsA majority of event management software users spent less than $1,000 dollars per monthTweet This a month on their event management software, with 31% spending $500 or less. 26% spent between $1,001 and $2,500, while 15% spent $2,501 and more. These numbers show event managers don’t have to spend much on event software. Indeed, with solutions like Eventbrite being the most popular options in our survey, it’s clear the cost of the software is being absorbed by attendees rather than the event organization itself. Interestingly enough, it turns out that 48% of respondents actually spent less money on event management software than they expected, while 33% spend about the same as expected, and only 19% spent more. This should ease any concerns of being able to justify this particular expense to management. Considering the relatively high monthly cost of many legacy and enterprise event management software solutions, assuming you’ll spend a lot is understandable but, as the data show, misguided. 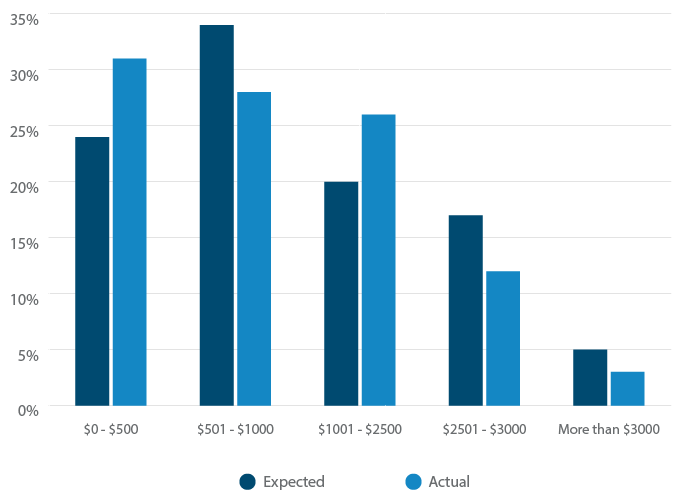 How do respondents feel about their software and return on investment? 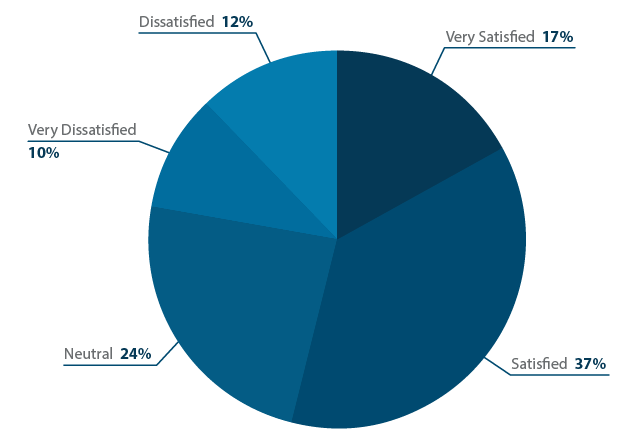 Surprisingly, respondents were relatively unhappy with their event software. Dissatisfaction for current event management software was the second highest rate we have seen at Capterra thus far in our industry studies, with 22% of respondents answering either “dissatisfied” or “very dissatisfied.” For comparison, only 11% of CRM users were dissatisfied or very dissatisfied with their software, and only 3% of membership management software users were. Only learning management system users were more unhappy with their software, at 26%. 24% of event software respondents were neutral about their software and only 54% said they were either “satisfied” or “very satisfied.” We’ll explain some of the reasons for these numbers below. The highest rated reason for dissatisfaction was a lack of certain features (39%), while 35% of respondents cited poor support. 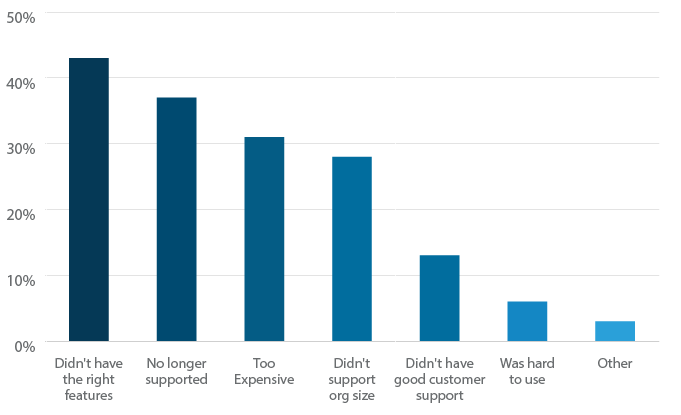 17% were dissatisfied because their software was too expensive, and 8% found their software too hard to use. Given that, as mentioned previously, 24% of respondents didn’t own event management software because they didn’t even know it existed, the assumption that they don’t know which features they need or costs to expect becomes all the more plausible. 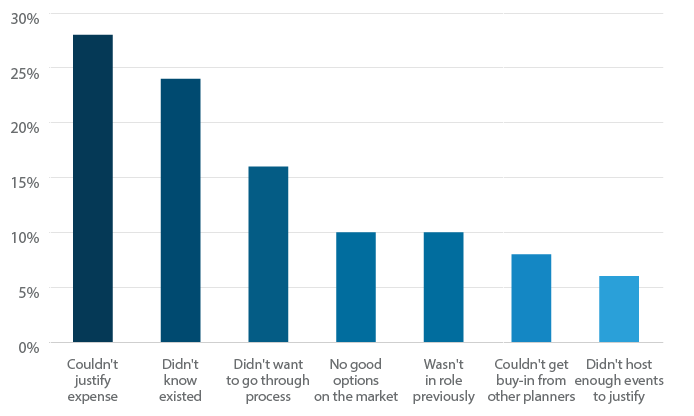 In fact, respondents who didn’t know the software existed before their purchase were 3% more likely to be dissatisfied with the software, perhaps due to lack of knowledge about event management software in general. 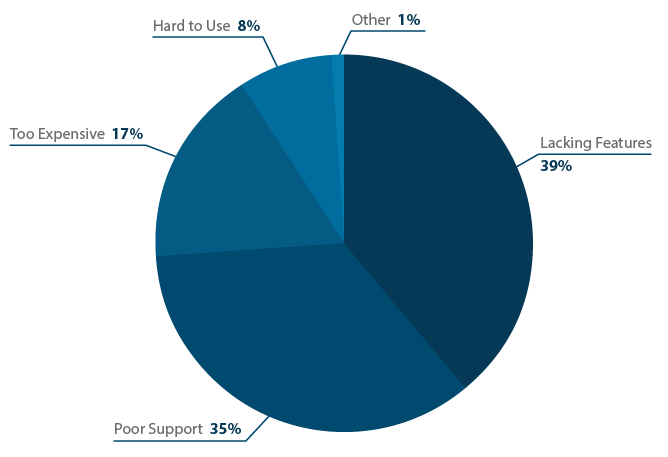 As for the 35% of respondents that cited poor support, the fact that only 8% of respondents found the software difficult to use could mean that people are calling support for actual technical issues like bugs, rather than just because they can’t understand the software. This in turn implies event management software vendors are not providing adequate patches to software issues and bugs, which leaves event planners to solve these issues on their own. In terms of length of use, the largest single portion of respondents (32%) have been using their software anywhere from six months to one year. 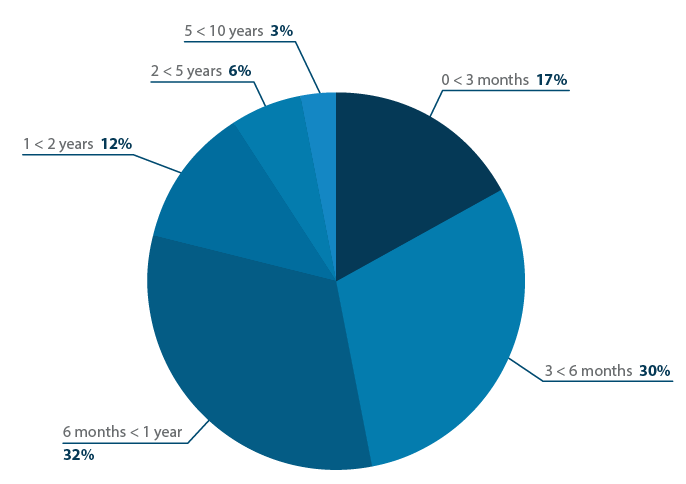 30% of respondents have had their current software for three to six months. 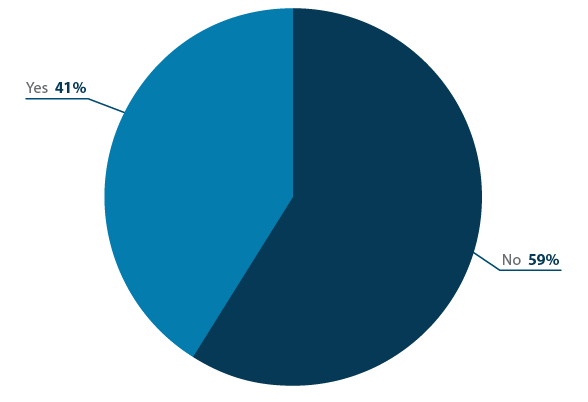 17% of respondents had their software option for three months or less. 18% of respondents have had their current software from one to five years, while only 3% have had it five to ten years . Finally, a scant 0.3% of respondents have had their event management software for more than ten years. This may be because of the 43% of respondents switching due to a lack of features such as RFID. Another cause for this short ownership time could be the 37% that switched due to their software losing support. In order to curb high abandonment rates, software vendors ought to consider lengthening their support windows to maintain users or consider adding newly desired features. Although price is an important beginning purchase factor, functionality is what keeps event managers tied to a particular software. However, there are issues with user retention due to a lack of desired features. Of the 41% of respondents that were using a different event system prior to their current software, 43% said their previous software did not have the features they needed. This means that although price was the initial concern of customers, functionality became much more important as their experience with their software progressed. When factoring in their return on investment, 61% of respondents answered that ticket sales increased and 58% said event attendance increased after purchasing event management softwareMany new event mgmt software users see a rise in ticket sales (61%) and event attendance (58%)Tweet This. Given this it seems clear that, for the majority of respondents, an event management software system is a worthwhile investment. While you should always ensure such a tool fits within your budget and larger strategic goals, the positive benefit to event growth shown here makes a strong case for adoption. Although a majority of respondents were first-time buyers of event management software, a sizeable portion of current users had already transitioned to their second or third system. The highest reason for transition was a lack of certain features, which also was the highest reason for software dissatisfaction. 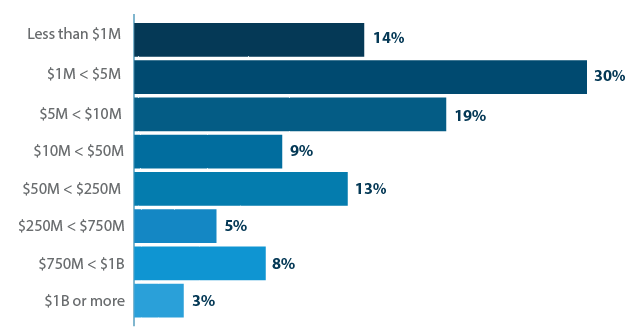 This shows a disconnect in what users require from their event management software and what vendors have offered in terms of functionality. With the second-highest dissatisfaction rate that we’ve seen in our software industry research, it seems clear event vendors need to make efforts to innovate with new features such as RFID technology and gamification, as well as work on improving their customer support for event planners. Luckily, it looks like the event management software industry is already on the way to fulfilling many of these desires in the coming years. We’re already seeing developments in iBeacon technology, 360 degree live streaming (which can alleviate issues with room block management), and new wearable technologies to assist with attendee management. One final conclusion to draw from our survey has to do with what it does not show. All of our respondents had to begin the survey by answering whether or not they use event management software. 56% of potential respondents answered “no,” which disqualified them from progressing further. This could mean that as many as 56% of event planners are not currently using any form of event management software. This is a huge number, and one that we’ll be monitoring in follow-up research to see if it trends downward, or remains sky-high. As the event software industry strives to meet the demands of event planners, and as a majority of current software users keep reporting a positive return on investment, we think the number of event planners without software will decrease dramatically. Plainly put, if you aren’t using event management software, now may be a good time to consider giving it a try. This 38 question survey was conducted over a period of two weeks and received 402 qualified responses. 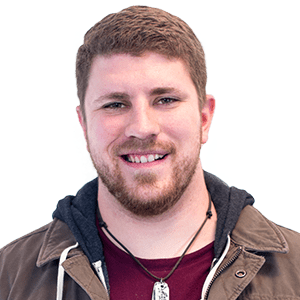 Nick Morpus is a Content Writer for Capterra, a free resource that matches buyers and sellers of business software. He has a background in politics, economics, and journalism, which he dedicates his off-time to contributing his thoughts to other political sites. In his free-time he enjoys reading, playing guitar, writing, cooking, and dominating the world of video games.